I ended a career in marketing in the financial biz in Holland, before I came here in January 2001. Although I was much more attracted to traveling in the Far East, and lived in Japan for a while, my first “Curacao experience” was an astonishing one. I had this click with the island immediately and was very much surprised to discover that the island has so much more to offer than sun, sea and beaches. 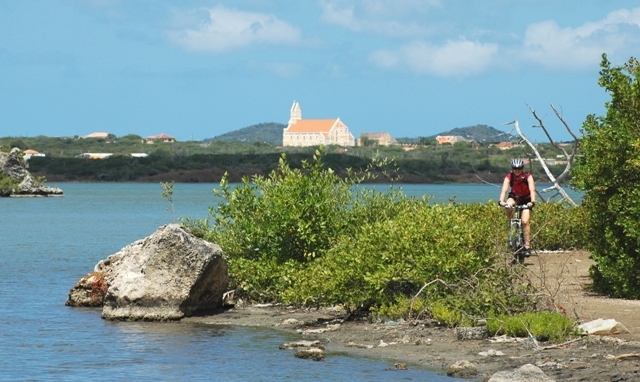 One moment you’ll be biking along the prominent limestone terraces at the north coast, the next you’ll find yourself surrounded by palm trees, tropical flowers, and mangrove forests, and before you know it you end up biking at salt flat or plantations, where clear marks from the history tell you Curacao’s story. The combination with a swim and some drinks on a beautiful beach after wards makes sure you have a wonderful time. Already then, I was thinking about sharing these beautiful moments with many more people, maybe even on a commercial base. The local mountain bike ‘hype’, the increasing number of cycling clubs and huge events such as: Amstel Curacao Race, Ride for the roses and especially the World Cup mountain biking in April 2006 contributed very much to the awareness of Curacao as a mountain bike island and destination. Bart Brentjes, the famous Dutch mountain biker, and Olympic medal winner even became an ambassador for Curacao. Therefore, I had the feeling that this was the right moment to start this “adventure”, and I decided to create my business out of my hobby: since January 2005, WannaBike is fully operational and until now, 5500 people enjoyed a WannaBike tour, clinic or event.